My first contact with artist Helen Hiebert was back in 2010 when she took one of my classes after she heard about my book, I’d Rather Be in the Studio. It’s been fun to watch her grow into a successful artist-entrepreneur. On the heels of my interview with Dianna Fritzler about transitioning to a full-time artist, I thought it was perfect for you to hear about Helen’s journey. ©2017 Helen Hiebert, Tangential. Artist’s book (edition of 30), Box size: 12-1/2 x 9-1/2 x 1 inch. Click photo for more info. Ten years ago, Helen didn’t think of her art as a business. Her shift of mindset changed everything and she now makes her living as a working artist. Rather than feeling icky about having a “business,” she embraced it and learned to channel some of her creativity into making money from her talents. Probably the biggest lesson for me has been learning how to keep myself entertained (I think any creative loves to do new things all the time) but to create a framework that allows for that. I’m thinking of my blog specifically. I now have a rotation of things I do throughout the month that is fun for me to generate and (hopefully) my readers to discover! See? You can have fun and run a successful art business at the same time. You only need a structure to contain that fun. ©2015 Helen Hiebert, 50 Revolutions. Artist’s book (edition of 35), Box size: 10 x 6 x 2 inches, Mini Mother Tree: 8 x 4 x 4 inches; Mapping Motherhood Print: 18 inches in diameter. Click photo for more info. Much of what she has tried and implemented has been learned from watching what other artists and non-artists are doing, and tweaking it to fit her approach. We also discuss Helen’s process for creating online content, which has its roots in the analog world she started in. Her success comes from networking, interviewing experts, and collaborating. From that evolved both her blog and podcast. Helen’s blog is The Sunday Paper – a weekly roundup of news from the world of paper, including news from her own studio. Her monthly podcast, Paper Talk, is the happy result of an unsuccessful grant application to document artists working in the field of hand papermaking. Please enjoy this conversation with Helen Hiebert. Music: Keep It Simple by Wildermiss. Used with permission. Listen to or subscribe on iTunes. 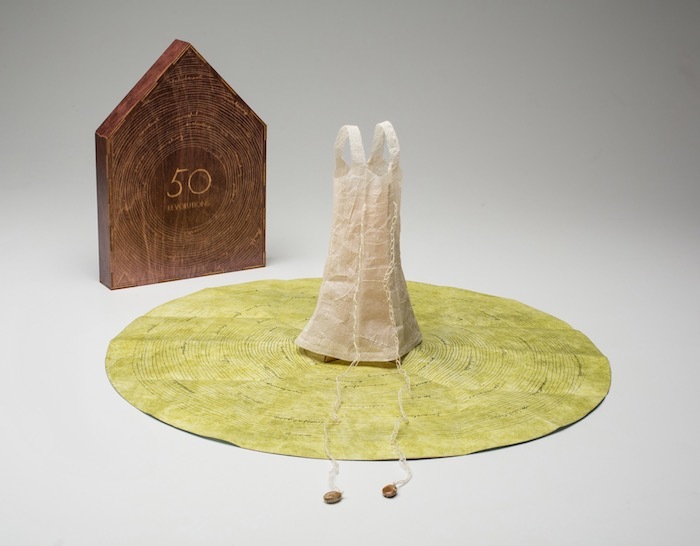 Helen Hiebert is a Colorado artist who constructs installations, sculptures, films, artists’ books and works in paper using handmade paper as her primary medium. She teaches, lectures and exhibits her work internationally and is the author of the books Papermaking with Plants, The Papermaker's Companion, Paper Illuminated, Playing With Paper, and Playing With Pop-Ups. Artist Helen Hiebert in her studio. Helen’s most recent installation, The Wish, is a giant dandelion sculpture at Anythink Huron Street Library in Denver. She holds an annual paper retreat in her Red Cliff studio each September. Read and subscribe to The Sunday Paper. This episode of the Art Biz Podcast is brought to you by my Art Biz Mastermind Workshops which will take place in Golden, Colorado (October 8-9) and Asheville, North Carolina (November 5-6). Don’t worry if you don’t know what your priorities are. I’ll help you prepare to get exactly what you need during our time together. This is an opportunity to get personal feedback from me at an affordable rate and in a fun place to visit! Please read about these workshops and join us this fall. Thank you, Alyson, these stories are fascinating and inspiring. You asked so many good questions, and Dianna and Helen were remarkably generous with their answers. Wow oh wow. What an inspirational (and okay, a bit intimidating in terms of Helen’s ongoing accomplishments)podcast! Having always been a paper lover, and increasingly exploring and using it in my own work…I found everything about this interview interesting. A paper blog I didn’t know about? Podcasts about paper? I’m in. Have signed up to get the blog/newsletters, followed Helen on IG and will also start listening to the podcasts. I also really enjoyed Helen’s website(and much more to explore there). I think I’ve mentioned this before Alyson, but one of the other things I love about your podcasts and newsletters(in addition to them being packed with helpful information), is being introduced to such a wide variety of artists (and their work)..with whom I might not already have been familiar. Such a wonderful added bonus. Thank you both! Glad you enjoyed it, Christine. And thank you for continuing to read and listen. Christine, I’m so glad you enjoyed the episode and that you’re a fellow paper lover! Thanks for hopping over and checking out what I offer – I hope you find inspiration and more. Thank you both! I am inspired by this podcast and both your careers. I have enjoyed watching Helen transform her paper life since I met her in the early 90’s! Boy, you really have witnessed her growth, Lauren. Thanks for listening Lauren… I hope you learned something new! Thank you Helen Hiebert for sharing your successes in a generous and straightforward way. Really appreciate your listening, Dawn. Since I transitioned to making Artist’s Books, I’ve been spending a lot of time puzzling about how to create income streams from them, so this podcast was SO inspiring! Off now to look at Helen’s blog! I WAS IMPRESSED WITHT HELEN HEILBERT STORY ON HOW SHE RETURNED BE INTO BEING A FULL TIME ARTIST. SHE USED NOT TRATIONAL WAYS TO GET CLIENTS TO SEE HER ARTWORK SUCH AS HOME/STUDIO SHOWS, WORKSHOPS, AND ALSO TRADITIONAL WAYS OF TENT SHOWS. I’ve enjoyed your presentation and learning about Artists’ Books. You’ve had a wonderful opportunity to explore and teach. Thanks for sharing your journey.